Okay all you almond extract lovers out there, this is another great recipe for you. When I first was looking over this recipe, it was the almond extract that caught my eye. Seriously, almond extract is amazing. Enough about the almond extract though, because that is not all that makes these cookies spectacular, but it definitely plays a factor. The combination of flavors; almond, chocolate, coconut (Sounds like I am describing Almond Joys, huh?!) all together make these cookies incredible! Don’t like coconut?… well, neither does my husband. You can successfully leave out the coconut if you desire. Just roll the dough in sugar instead. 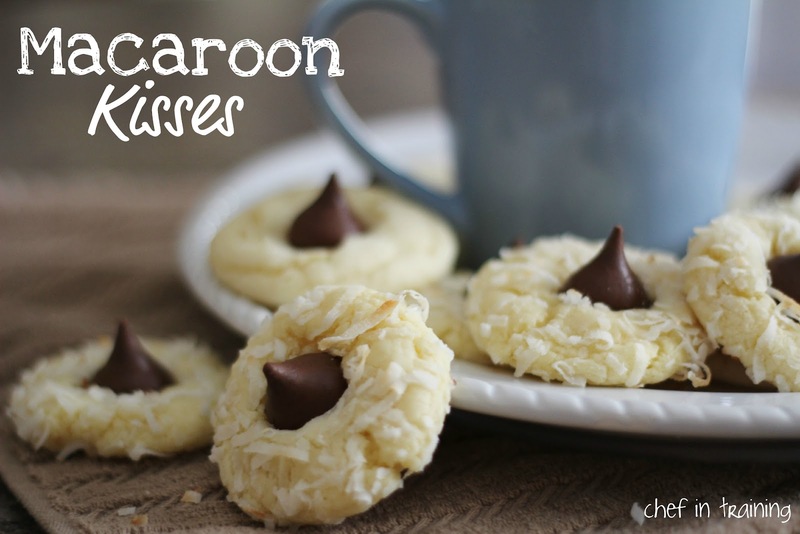 Coconut and chocolate come together to form one delicious cookie! In a large bowl, cream the butter, cream cheese and sugar together. Beat in egg yolk and almond extract until well combined. In a separate bowl, combine the flour, baking powder and salt. Gradually add the flour mixture to the creamed mixture and mix well. Stir in 3 cups coconut. Cover and refrigerate for 1 hour or until dough is easier to work with. Roll into 1-inch balls and roll in remaining coconut. Place 2 inches apart on ungreased baking sheets. Bake at 350 degrees F for 10-12 minutes or until lightly browned. After removing from oven, immediately press a chocolate kiss into the center of each cookie. Mmmm, can't wait to make these! Yum! These cookies look and sound so good!! This is one I need to make!!! Mmmm, chocolate and coconut!! These look amazing...I love coconut and almond...and Almond Joys! They look delicious! They would be a hit at our home. I've been on an Almond Joy kick, I am actually drinking Almond Joy creamer in my coffee right now. Those look wonderful! I will definitely be making those soon! I love almond joys. These cookies look absolutely amazing. Made these cookies tonight as an addition to my standard Christmas cookie repertoire. They are absolutely delicious! These cookies were amazing--I got compliments on them from everyone who tried one, even people who don't like coconut. And they couldn't have been easier. I can't wait to make these again! I made these for Christmas this year and WOW. These cookies are amazing. We're all coconut and almond lovers in this house and I think this is our new favorite cookie. Definitely will be a staple of our Christmas cookie baking from here on out. Thanks so much! Thanks for this yummy macaroons !!!! I'm not sure what I did wrong. Are the cookies supposed to flatten some when cooking? Mine didn't. They did when I pressed the kiss on top. Some broke apart, too. I had to carefully press the cookie back into a circle. Is the only way to tell if they are cooked by how toasted the coconut is? Mine aren't chewy like a macaroon or Almond Joy. Pretty dry actually. My coconut was fresh and very moist so I am surprised. And disappointed. They do look cute. I do not like almonds. Can I replace with vanilla? Can you tell me if the coconut in the almond joy cookie recipe should be sweetened coconut or not. Thanks! I don't have kisses, couldn't I just use chocolate chips? I will bake these tomorrow for my almond and coconut friends. Is the coconut UNSWEETENED ?? ...and packed into measuring cup like brown sugar? I am adding these to the Christmas baking list. They look so delicious!! I made these today and they turned out pretty good other than I found the almond extract flavour took over the whole cookie I could hardly taste the coconut. I would recommend 1 1/4 tsp possibly even 1 tsp of almond extract instead of 2 tsp.